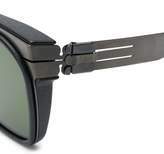 Dark grey square tinted sunglasses from IC! Berlin featuring square frames and tinted lenses. This item is unisex. This item comes with a protective case.